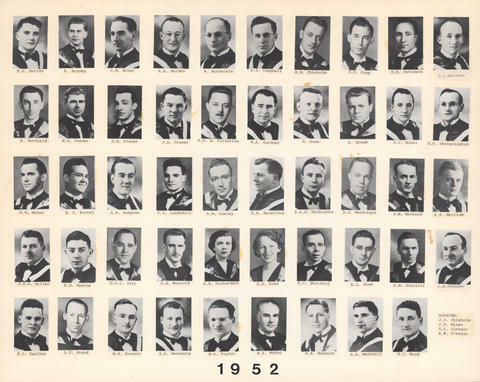 File is a composite photograph the Dalhousie Faculty of Medicine graduating Class of 1952. Photograph includes 49 individual portraits mounted on cardstock. Portraits include: K.D. Barron; R. Brooks; L.M. Brown; R.A. Burden; M. Burnstein; A.J. Campbell; W.M. Chisholm; S.E. Copp; C.R. Davidson; D.L. Davison; A. Dunfield; M.G. Feener; D.H. Fisher; J.H. Fraser; S.G.B. Fullerton; W.A. Gardner; D. Gass; R. Groom; J.J. Hazel; H.G. Hetherington; A.M. House; B.D. Karrel; A.R. Kempton; F.C. Landsdall; A.M. Lawley; E.D. MacArthur; D.A.G. MacEachen; D.J. MacGregor; J.H. MacLeod; R.K. Merriam; J.E.H. Miller; R.G. Munroe; D.C.C. Pitt; E.N. Reynold; A.B. Richardson; E.D. Ross; R.C. Shatford; A.J. Shaw; A.M. Sinclair; L.A. Skinner; S.L. Speller; L.T. Stead; W.B. Stewart; A.R. Swanburg; W.K. Taylor; R.S. Wadup; R.N. Webster; R.A. Wentzell; W.C. Wood.